My life is a little hectic. The countdown to Passover has begun. We are also going to be moving soon. So, even more than before, I am particularly time challenged. Passover is the time of year when we eliminate all leavened products from our home. Practically, this means I try to clean out my pantry and freezer. I still have leftover hamentashen filling. So I thought that I would try to make roasted chicken and use the hamentashen filling as a glaze. Plus, additional cinnamon to the chicken. Boil all ingredients in a pot until soft. For the hamentashen, the filling needs to be slightly thick, so it is important not to add too much water. As a glaze for chicken,more liquid and more cinnamon is needed. Place chicken in large pan. 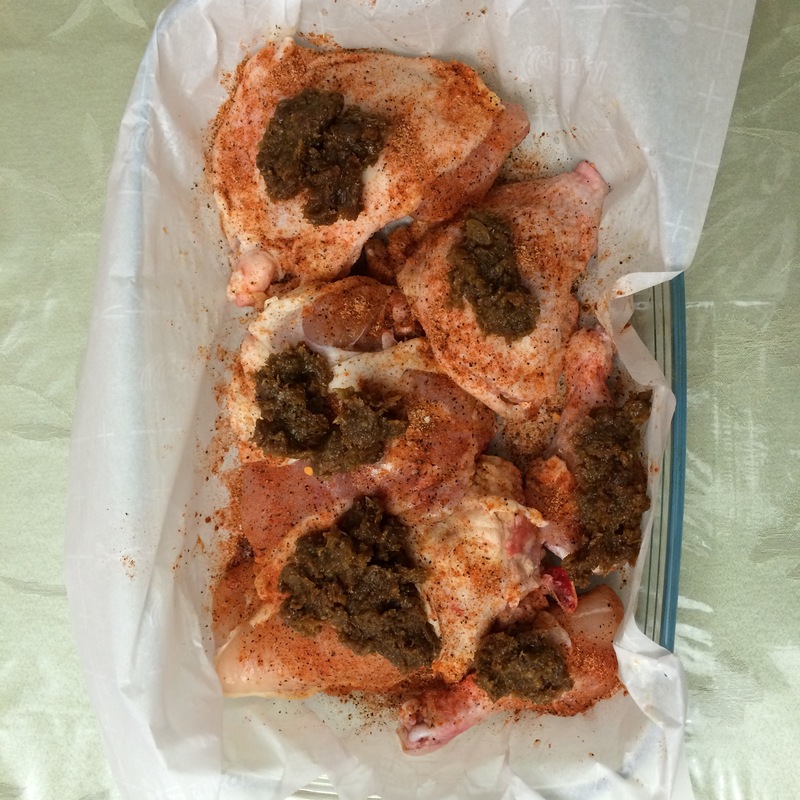 Season chicken with Mom’s Spice Rub, and then add the hamentashen filling on top. If possible, let marinate prior to cooking. Roast in oven for 1.5 hours, or until cooked, turning over for last 30 minutes. After I started cooking, I realized it was too thick. So, I added more filling, with a thinner consistency when I turned the chicken over. I also added more cinnamon. Oh, this looks so tasty! I was thinking of steaks for supper, but perhaps I will have to think about chicken as an option. mmm. . . This looks wonderful. And, the story of the missing leg in the picture provides strong evidence that this dish is awesome.. It was so funny I decided to leave it. Kind of like a slice of life. Such an interesting recipe! It looks delicious! Thank you! It came out better than expected. I think the cinnamon really helped. Wow this sounds amazing! I agree with Raizel! She was so funny, my budding gourmet! That chicken just sounds savory, amazing and delicious! I love the flavors and have to try this! It was good. I think I am going to experiment to get the texture a bit different. I thinned it with water. Maybe try balsamic vinegar? yumm that would really be good Carol! I think it could make a richer taste. yumm please tell me how it works out! Wow this sounds so full of flavor! I can see why everyone liked it so much! This is amazing Carol. I love how it is done with dried fruit ! I like to do a roast chicken once a week, so this is going to be a lovely change on my usual. Haven’t tried it yet.. Got a little behind ducking the weather in my travels.. I need to get my cooking done today after I get some sleep.. And that is on my list.. I cook with boneless skinless chicken thighs often but have never had a problem with them being dry.. And I trim any excess fat still on the meat.. Boneless skinless chicken breast is a bit trickier but I use the first 15 minutes of cooktime at 450f then down to 350f for the remainder of time.. And I do the same with all meats I roast, just the turn down temp varies.. Beef, the turn down temp is 375f.. Pork and turkey turn down temp is 325f.. But it is a small convection oven, the heat is constantly swirling around the meat and/or pan.. My dad’s full size oven has a setting for convection but my small oven does much better than his.. I think the size has everything to do with it.. Smaller being better in this case..
I’ll post my results when I do the mighty taste test.. I love basalmic vinegar ! I found really aged balsamic vinegar and then knew what I’d been missing.. It costs a little more but a little goes a long way.. I couldn’t believe the difference between that and the bit cheaper versions.. I have heard that. It’s hard to find. Real balsamic vinegar is a work of art. It’s that much richer that I have ordered it before when I couldn’t find it.. The tang from the vinegar is just right.. A perfect salad dressing for me is raspberries cooked gently with just a little water, then add the aged balsamic vinegar to taste.. 2 ingredients easy to balance.. no need to add sugar.. the raspberries naturally sweeten some with heating and the basalmic vinegar takes care of the rest of the sweetness.. I marinate chicken and pork in the same mix for salad dressing, bake and top with scallions the last 5 minutes of cook time.. Easy and tasty..
I’m finally going to have some time this weekend for some recipes to try out.. That filling sounds so good.. I have some boneless skinless chicken thighs on hand and now decided to try this recipe with them.. No walnuts but I have cashews.. I hope they make a substitution..
Cinnamon is such a lovely spice and very healthy, so having it on the chicken and in the filling makes me happy..
How did it come out? Any nuts are good. I think it just helps the texture. 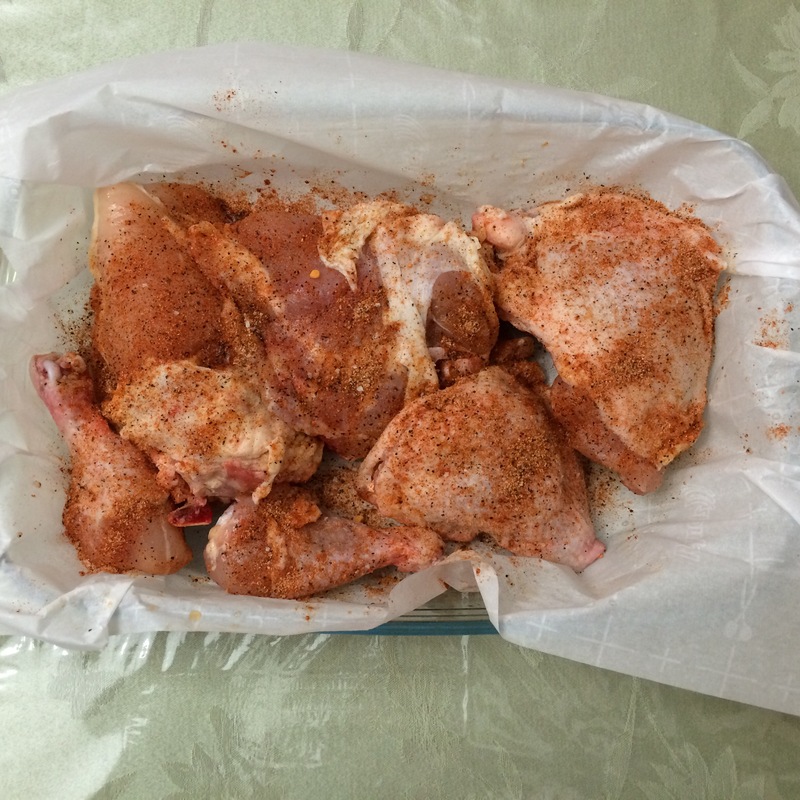 I am curious about using the boneless chicken thighs. They tend to be dry. I think you might need to add oil too. I hope your move is going well.. I’m going to cook some breakfast take Stewie out, then it’s some “me” time having fun in my tiny kitchen.. Along with the chicken thighs I have 4 center cut boneless porkchops.. I think I’m going to stuff 2 of them with this filling.. Can’t wait to see how it all turns out ! Please let me know. Sounds yummy! I had guests this week, so I am all cleaned out. 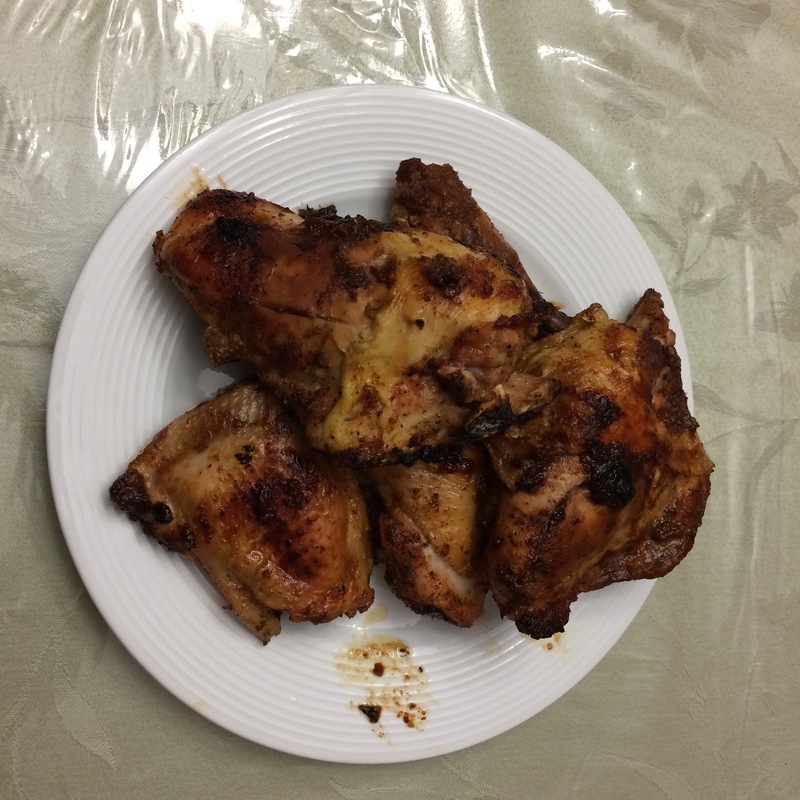 And, I think you are right about the chicken thighs being less dry than the breasts. Well I did it, kinda sorta.. I didn’t get to the store like I hoped, so made substitutions.. It turned out really nice and I’m looking forward to trying it following your recipe.. I linked my readers over here for the correct recipe.. Thank you Carol ! My pleasure! It’s so nice when we can exchange recipes! Sorry, I missed this. I love what you did with the concept. The applesauce was a good idea too. When I make your filling ( that I cannot pronounce ) I’m going to try it in both meats as well..
Prunes are pretty sweet. But the applesauce also gives moisture. I thought what you made was really creative! I am going to make it again this week, using balsamic vinegar. Hopefully by then, it will be all used up. Good looking chicken dish. I enjoy your sharing of your faith traditions. Thank you! I feel like if I don’t explain them, then people might not understand what I am talking about, but, I try to not be too detailed. The chicken was a hit! It was so funny. Even though I made this in the morning, Raizel ate the chicken for breakfast! My budding gourmet, she likes to eat chicken when it’s fresh. Ya. Who don’t like delicious food. She is very blessed to have a mom like you. Yes definitely. Good simple presentation. Wow looks so delicious. Definitely gone give a try.